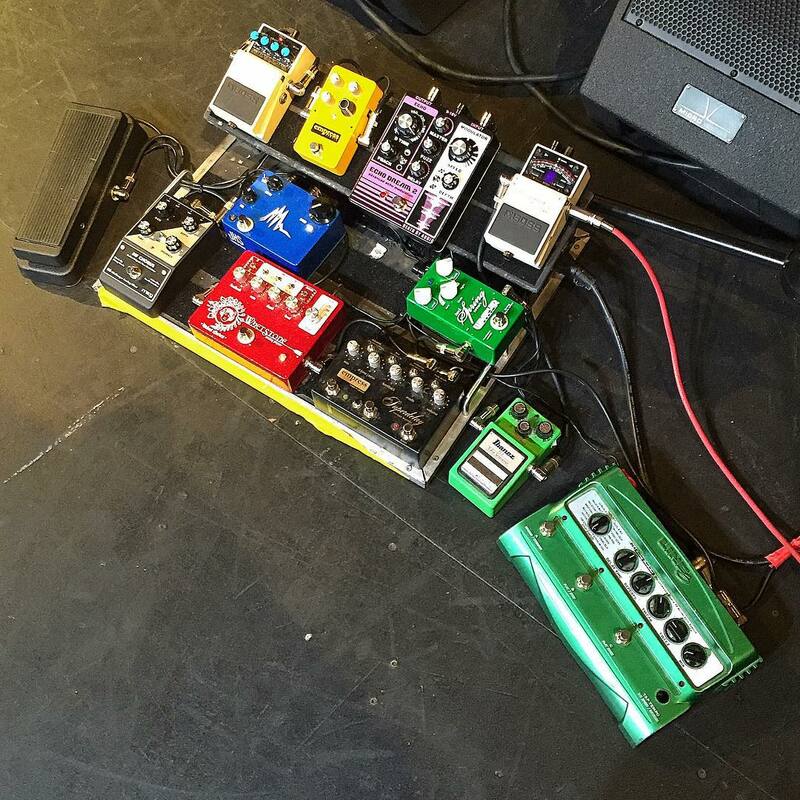 Matt Bellamy's guitar tech Jason Baskin says the Cry Baby Wah pedal in Bellamy's pedalboard is connected to the Dunlop Rack Wah. "I use it [the Reel Echo] a lot in conjunction with a Cry Baby wah. You can set the echo pedal to infinite and you can use it almost like a tone generator. When you run that through the wah, it's amazing what sounds you can come up with, so I use it a lot to create these "beds" of sound. There's a lot of that on "Tomorrow's Food" and on the bridge section to "Adolescents" as well." "As far as effects go...sometimes the original Cry Baby. I've been going back and forth between that and the Real McCoy. Wah, I'm trying to get it right." Omar added a standard crybaby to his rig on the first ANTEMASQUE tour with Travis Barker in November of 2015. The last time he had a Wah on his pedal board was in 2012 for the final Mars Volta tour. "I'm using a Dunlop Wah-Wah," said Steve Vai about his Dunlop Original Cry Baby Wah Pedal. Mike Campbell's guitar tech mentions a Dunlop Original Cry Baby Wah Pedal is used in their rig. "We got the Wah controller for the Dunlop system," says John Petrucci's guitar tech. "I also use a Dunlop Crybaby Wah pedal." Eric Clapton used this Pedal at the "Baloise Session" on the Song "Pretending". "And then it goes into my Cry Baby wah wah." A Dunlop Cry Baby Original Wah is also used by Carlos Santana but it's painted violet. From the site of Dunlop, the manufacturers of both the original Cry Baby and the Eddie Van Halen Signature Wah: "The EVH Wah was developed after intensive design collaboration with the legendary guitarist, Eddie Van Halen. Early on in the process, Eddie handed over his “Holy Grail” Cry Baby—a standard Cry Baby customized in the early Nineties with a more vocal-like, High Q inductor and a wider frequency sweep..." This suggests that the current (vividly yellow) EVH model is not the exact pedal that Eddie Van Halen used, but rather a 'standard Cry Baby' that was modified to suit Eddie's needs and dubbed the "Holy Grail". Used in the early days. Most likely modded. A Queen tech talks through their live setup, including Brian May's Dunlop GCB95 Cry Baby Wah Wah and the flat EQ settings that he prefers. The pedal can be seen in this video at (10:12). The Dunlop Cry Baby Wah Wah is featured in [this Guitar Geek rig rundown](http://www.guitargeek.com/randy-rhoads-ozzy-osbourne-1981-guitar-rig-and-gear-setup-diagram/) of Randy's live setup. In "Money For Nothing", Mark uses a wah set almost wide open. You can definitely hear it in live recordings. Hammet recalls that during the recording of Metallica's *Ride the Lightning*, he "had the [Dunlop] Cry Baby wah [he's] always had." Considering that the only Dunlop wah available during the time of the *Ride the Lightning* sessions was the GCB95, Hammet must have used this wah on the album. As you can see (above), Reb's pedalboard is constantly evolving as he adds and discards effects - it ain't the neatest thing you've ever seen! We asked Reb to describe his signal path: "My signal goes into very expensive Shure wireless units, which are the closest thing to being on a cable I have found. From there it goes into a Bradshaw router that helps with guitar changes. Then it goes to the pedalboard and out to the amps." "The pedalboard signal goes to a Cry Baby wah, a Boss Metal Zone distortion, a Danelectro echo for long delays when making weird noises, a Boss tuner and a Digitech Whammy pedal, which is in a loop because it messes with my signal in line. The whammy pedal is great with the long delay for weird noises. Then to a A/B box, which chooses between clean or dirty amps." "The clean line goes from the A/B box into a Guild Hartke bass head with a TC electronics multi effects unit for wetness. The bass head gives a very loud full clean sound. The other signal from the A/B box goes to the Marshall dirty heads." Reb has recently replaced the Boss Overdrive pedal seen on his Homegrown DVD with the Boss Metal Zone, as he felt that the overdrive pedal (used for solo boost) was taking away too much low end. Anyone who has heard Reb's live sound on the 2004 Whitesnake tour will agree he made the right choice! A few of the devices Ernie Isley used on That Lady recording. This is the Wah pedal that Dj Lethal Uses. You can see the Dunlop wah on this picture. 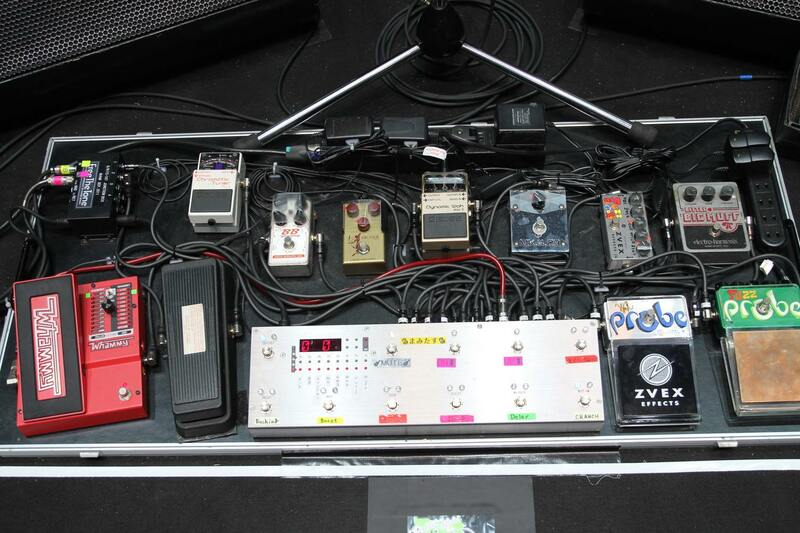 We can see in the picture from Weezerpedia the pedal. A Dunlop Cry Baby GCB95, Wah Wah Pedal. A Cry Baby Wah can be seen on Barry Stock's pedalboard at 5:21 in this rig rundown video. 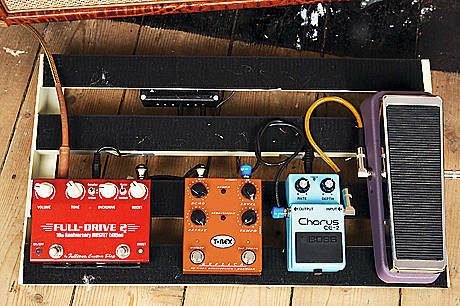 Seen on Bryson's pedalboard in this article by Effects Bay. 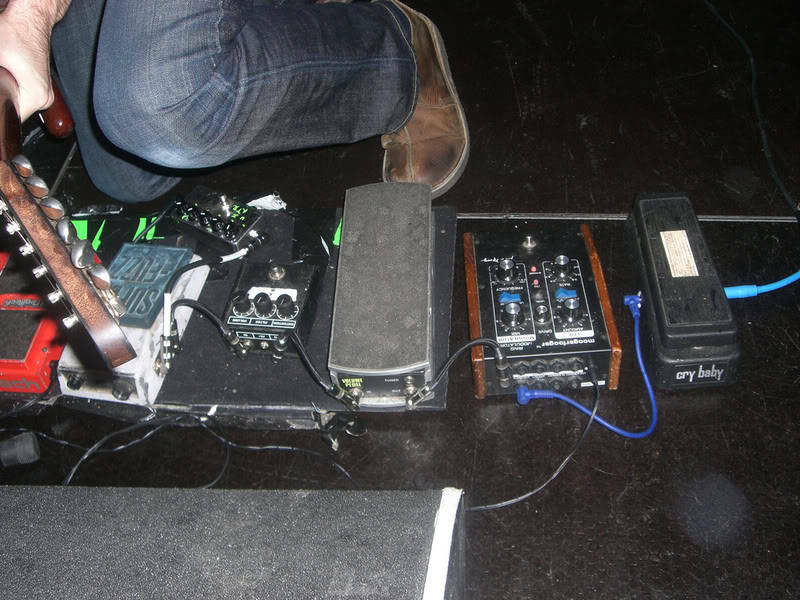 According to [this](http://www.guitargeek.com/christian-olde-wolbers-fear-factory-guitar-rig-and-gear-setup-2005/) gear diagram of Christian Olde Wolbers' Fear Factory stage setup, he uses a Dunlop Cry Baby Wah Wah. According to Premier Guitar's rig rundown, Stewart uses Dunlop GCB95 Wah pedal. 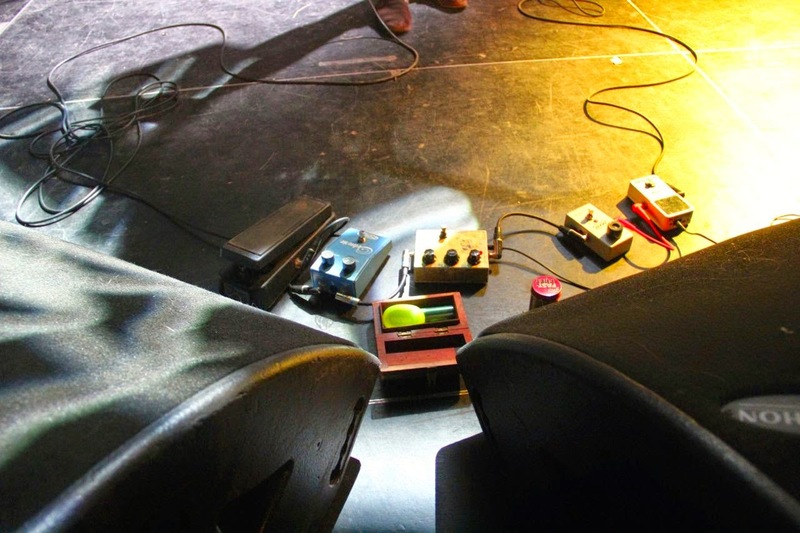 It is unknown of which Wah pedal he uses. We can see clearly an dunlop crybaby on Steve Pedalboard. In certain shots you can see the wah in front of Kath next to the microphone stand. 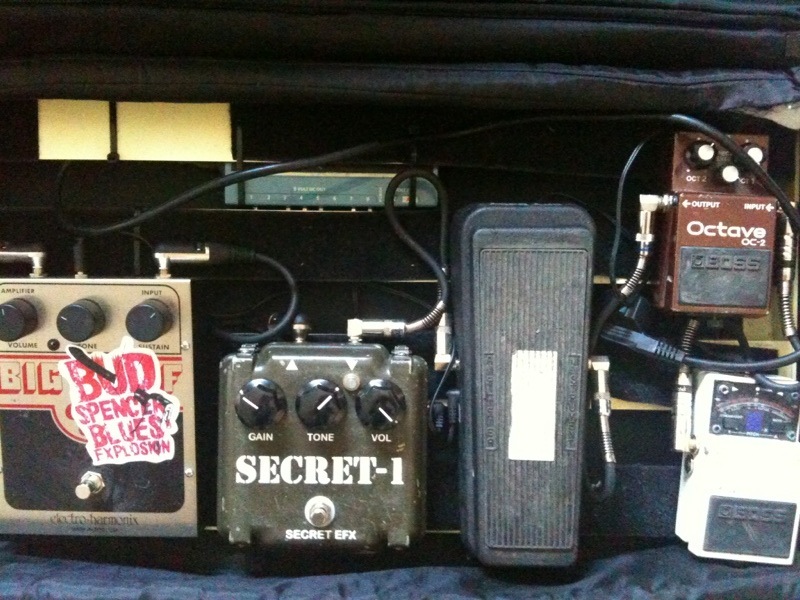 On this photo you can see Dorian pedalboard which includes **Dunlop Cry Baby**. Original article [here] (http://theguitarzombie.blogspot.com/2014/10/dorian-sorriaux-from-blues-pills.html) >Then I have a Cry Baby, of course, it´s an old one. I like it because it's easy to get started. Can also be seen on his pedalboard in episode 1 of NOFX Backstage Passport at 13:47. 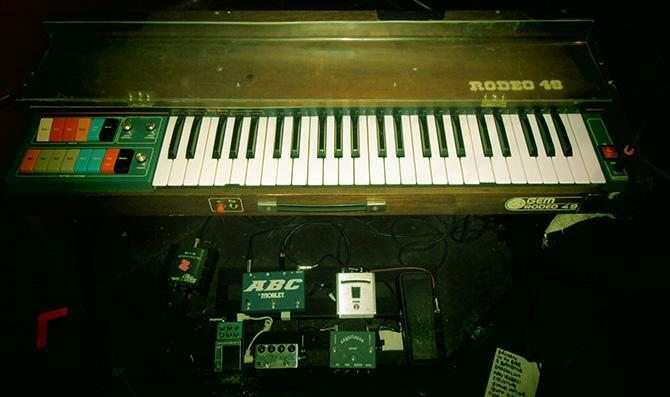 In this photo, where Hambel's pedalboard is seen, the Dunlop GCB95 wah pedal is visible. [This](http://www.guitargeek.com/pepper-keenan-down-guitar-rig-and-gear-setup-2008/) detailed gear diagram of Pepper Keenan's Down stage setup, which traces the signal flow of the equipment in his 2008 guitar rig, includes a Dunlop Cry Baby Wah Wah pedal. 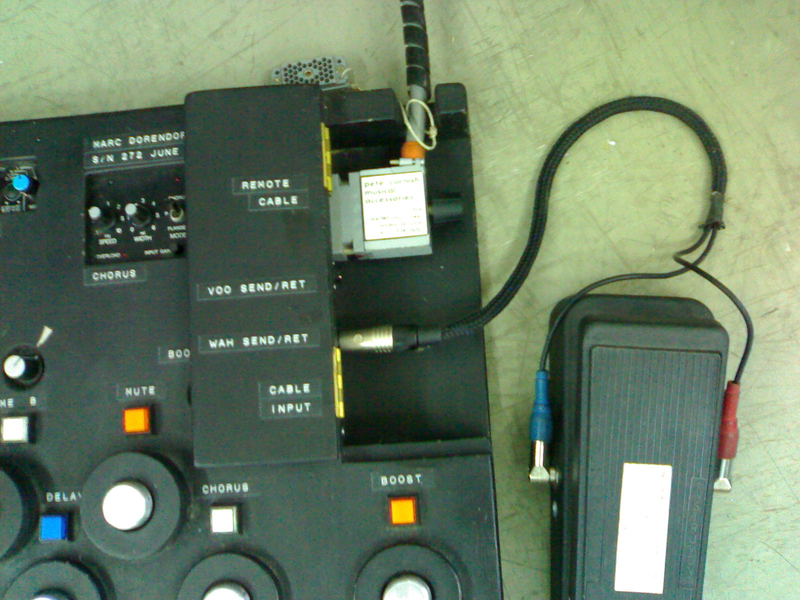 We use a modified cry baby with a frequency sweep selector for mono synths and guitars. He bought that wah pedal and did a hendrix cover with it in the video, at 2:16 the model of the pedal 'GCB95' can be clearly seen on it. Per i pedali: ho un wah wah Crybaby (dopo aver rotto almeno tre wah Dearmond in giro per concerti, ho deciso di prendermelo standard, così posso comprarmene ovunque uno uguale in caso di guasto, e quando sei in giro soprattutto all'estero succede di tutto!). "Loving my pedalboard at the moment"
Marc Dorendorf uses the Dunlop GCB95 Cry Baby Wah Wah pedal, which is connected to his effectboard via custom-made Pete Cornish stereo cable. REVISION- it is actualy a 535q wah, from some concert photos of front row seats you can see the control dial on the side. 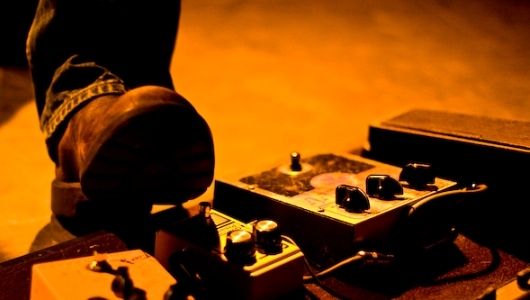 "Another new thing I’ve been honing in on is my wah-wah pedals. Over the last few months, I’ve been incorporating a Dunlop wah to add more dimension to my playing during the shows.”". This Pedal can be seen on Sergio's pedalboard for the Reckless EP recordings however it has zebra print tape on it. calidos bajos y calidos altos, el amplio rango que le da a Marcel su Dunlop wah gcb95... es perfecto. I use this mainly nowadays to get more ambient textures out of my amp than anything else but when I first got it I used it for a lot of reggae and I can't imagine not having one. The classic. Everyone's gotta have one. I have only ever owned one wah wah pedal and that is because I have only ever needed one wah wah pedal! That pedal is this pedal! No extra buttons or anything like it just normal wah wah. if you are looking for a standard reliable wah pedal this is the one for you! Put your foot down and be heard. This pedal is a hard rock mainstay. what else can i say? Great sounding wah and was really good priced for me. 4.8/5 - So good. Still squeaks though. This is the best wah pedal you could buy. It sounds so good, and there's just nothing better for classic wah sound. It's just excellent. The only downfall is the squeaking. It'll squeak relentlessly, but WD40 usually helps. what can i say? i love it, cheaper and louder! This pedal is a classic, and with a little internal adjusting, it produces the phenomenal tone that you hear on thousands of classic rock songs! I don't usually use this pedal, I have it on my board just so I have the option of using it. They're the standard that wahs are judged by. I've been using Cry Baby Wah's since I first start playing the guitar many years ago. The cry baby pedal is really good and I love it! It sounds really good with my Les Paul and Strat! Easy to use and durable. I've had this one for 25 years..no longer actually. I use to for expression and subtle "crying" and also for percussive chunking and accents. Must have for anyone that wants to do floaty sounding reggae-ish songs every once in a while. Easy to use. iThis is it. One of the classic guitar pedals that started it all. The Dunlop Original Cry Baby Wah Wah Pedal is arguably one the most famous of Dunlop pedals with wah being one of most famous effects of all time. This iteration of the legendary Cry Baby Wah remains true to the orginal Thomas Organ design from 1966. Let’s see how it holds up to the test of time in our Dunlop Original Cry Baby Wah Wah pedal review. Want to know what a Cry Baby wah pedal sounds like? Go check out Voodoo Child (Slight Return) by Jimi Hendrix and Eric Clapton’s solo at the end of White Room by Cream. These are just a couple of the famous performances that o we their existence to the sound of the Cry Baby. I love the sound of these. again, nothing fancy, just does what it needs to.